A brilliant 90-minute documentary filmed by directors Yann Arthus-Bertrand and Michael Pitiot, along with their team in partnership with the scientific support of Tara Expeditions, captures the extraordinary images of our remarkable oceans - the source of all life on our planet. Planet Ocean, presented at Earth Summit 2012 in Rio de Janeiro (RIO+20), Brazil in June, is a collaborative film that aims to explain some of the planet's greatest natural mysteries and highlights how essential it is that mankind learns to live in harmony with our oceans. The premiere of Planet Ocean at the Rio+20 Summit presents outstanding aerial and underwater ocean views from across more than 20 countries to illustrate and educate the audience about the beauty covering the surface of our planet and the challenges we have forced upon the marine ecosystems we depend on. Directors Yann Arthus-Bertrand and Michael Pitiot have worked with other activists, scientists and enthusiasts to bring to audiences the 90-minute documentary that serves not only as a prime example of Earth’s beauty, but as an illustration of the dangers that threaten our ocean and our entire planet. It was been created to change the way people look at the oceans and encourages them to imagine conservation as a globally-shared responsibility. his collaborative film aims to explain some of the planet’s greatest natural mysteries and highlights how essential it is that mankind learns to live in harmony with our oceans. The majestic underwater imagery brings to life the relationship we have with this precious life source and how it has changed over time as we have developed. Planet Ocean also serves as reminder of the bond between humans and nature, and the duty that exists to protect and respect our planet. It allows young people to imagine that a more sustainable world is not only desirable but achievable. As president and founder of GoodPlanet, Yann Arthus-Bertrand is committed to raising public awareness of environmental issues. Throughout his life he has been incredibly involved with various productions that have emphasized his enthusiasm and passion for the natural environment. Michael Pitiot has also dedicated his life to exploring and capturing the environment. More recently his productions have focused on the mysteries and explorations of the oceans, and the relationship humans have with this marine environment. The Office of Naval Research's efforts in funding ocean research are yielding improved weather and ocean prediction models that help Navy leaders understand how to route ships around the globe to avoid storms, reduce fuel consumption, avoid Arctic ice flows and promoted safety at sea. With the Atlantic hurricane season officially beginning this month, the Office of Naval Research (ONR) is pursuing a number of projects to help Navy forecasters and meteorologists around the world predict storms better. "Weather is one of the most significant factors affecting naval operations at sea," said Chief of Naval Research Rear Adm. Matthew Klunder. "ONR-funded research in weather prediction is improving the Navy's forecasting capability and accuracy for any location around the world where our Sailors and Marines are conducting missions." ONR's efforts in funding ocean research are yielding enhanced weather and ocean prediction models—highlighted in a new video—that help Navy leaders understand how to route ships around the globe to avoid storms, reduce fuel consumption, avoid Arctic ice flows and promote safety at sea. At the Fleet Weather Center in Norfolk, Va., Navy meteorologists depend on ONR-developed weather models and tools to provide timely, comprehensive and tactically-relevant products and services to support Fleet training and operations. "We use real-time sensing data, observations from ships and combine that with modeling outputs to try and get as far ahead of the bad weather as possible," said Commander Adam Newton, Operations Officer. "This information improves safety at sea and can give the Fleet a real warfighting advantage." While the Navy forecasters focus on supporting Fleet operations around the world, ONR often partners with the National Oceanic and Atmospheric Administration (NOAA) because the same data and weather models that Navy forecasters use also help NOAA to provide accurate weather prediction and storm warnings across the country. "There is a concerted effort to link various atmospheric and oceanic models together to attain more accurate weather forecasts," said Dan Eleuterio, an ONR program officer. Eleuterio is working on a new computer model called the Tropical Cyclone Coupled Ocean/Atmospheric Mesoscale Prediction System, or TC-COAMPS, which allows scientists to forecast storms' track and strength in real time at high resolution. It was the first dynamic model to demonstrate better skill than statistical approaches at NOAA's National Hurricane Center, and is one of several Navy and NOAA models being evaluated by the National Weather Service's Hurricane Forecast Improvement Program. "Up until now, predicting the intensity of storms was done with statistical-dynamical models," said Eleuterio. "What that means is that forecasters would look at several decades of observed data and they would simply say that if a storm is in this place this season, it is most likely going to get stronger or weaker or change. It wasn't an actual prediction, and TC-COAMPS will change that as a next-generation weather prediction model." ONR researchers work with underwater autonomous vehicles, ocean gliders and other sensors to collect information about how much the ocean environment drives global weather patterns. That data helps scientists improve mathematical equations for computer models that predict weather, ocean, sea, and even Arctic ice conditions. The Navy has a long history of conducting missions in the Arctic for research and military purposes, and in 2009 published the Navy Arctic Roadmap to help ensure naval readiness and capability and promote maritime security in the Arctic region. Developed by the Navy's Task Force Climate Change, the plan includes increasing operational experience, promoting cooperative partnerships and improving environmental understanding. "The Arctic ice flows are retreating, and that has strategic implications for our country and naval operations in that region of the world as sea lanes open for shipping," said Rear Adm. David Titley, director of the Navy's Task Force Climate Change. "ONR research is helping us understand the Arctic environment, which helps us predict conditions and design future Navy ships better suited for that tough mission." Tracking the sea ice cover is the responsibility of the National Ice Center (NIC), a multi-agency organization operated by the Navy, NOAA and the United States Coast Guard in Suitland, Md. "Weather modeling is really key to better understanding and forecasting of changing ice conditions in the Arctic," said Pablo Clemente-Colón, NIC's chief scientist. In the future, ONR researchers hope to combine multiple weather prediction models to create a comprehensive coupled global model that will greatly extend prediction capability, accuracy and our understanding of the world's environment. On 21 June each year the International Hydrographic Organization celebrates World Hydrography Day. 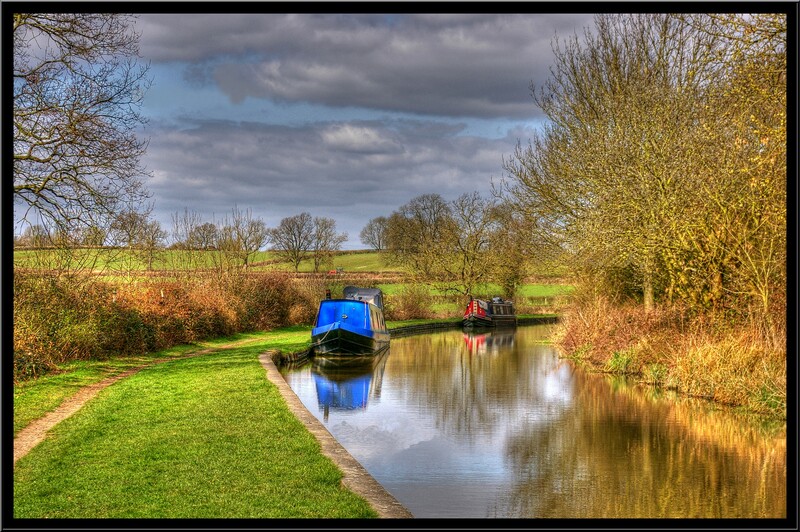 The theme for 2012 is: ’International Hydrographic Co-operation – supporting safe navigation’. In-line with World Hydrography Day, new electronic navigational chart services have been introduced to vessels operating in Australian and Papua New Guinean waters. Commodore Rod Nairn who is the Hydrographer for the Royal Australian Navy launched the use of the new systems at the Australian Hydrographic Office in Wollongong. Celebrated annually, World Hydrography Day recognises the important role hydrography and nautical cartography plays in regard to maritime safety, trade and environmental protection. Hydrography is the charting of water topographic features and nautical cartography is the study and practice of making maps – both pivotal to the operations of mariners and the Royal Australian Navy. Commodore Nairn says this type of technology will be particularly useful in the northern waters of Australia, where they are the most environmentally sensitive. He says the information mapped and charted by the Australian Hydrographic Office can be accessed by members of the public. “We’re the national charting authority, not just the Navy charting authority,” said Commodore Nairn. With a great knowledge of the Navy, from his earlier years in service, Peter Riley spoke to Commodore Nairn on 97.3 ABC Illawarra Breakfast. The amount of ice in Arctic waters waxes and wanes with the change of the seasons, though some ice persists in the Arctic Ocean even throughout the summer. But in Canada's Hudson Bay, sea ice can completely melt out during the summer months. A NASA satellite has caught the melt of ice in the bay during this spring, showing the dramatic shifts that the changing of seasons can cause. The Moderate Resolution Imaging Spectroradiometer (MODIS) on NASA's Aqua satellite snapped images of the southeastern corner of Hudson Bay on April 6 (top), and June 5 (bottom). The images have been rotated and north is at right. 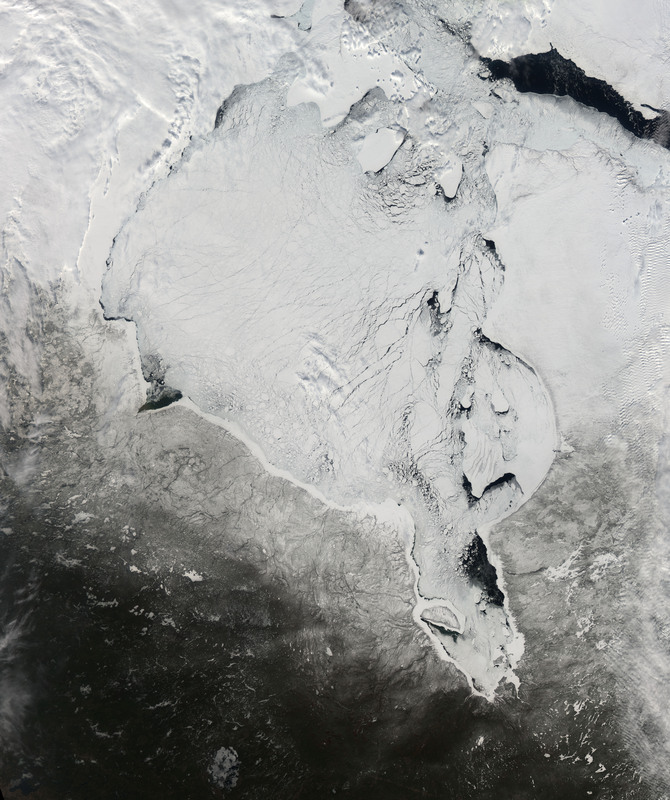 In the April image, snow blankets most of the land around this corner of the bay, and sea ice covers most of the water. The ice isn't a solid sheet, instead, chunks of ice of varying sizes and shapes drift around the bay with the prevailing winds and water currents. Pieces of dark ocean water are visible near the shore where the winds have pushed the ice away. In the June image, snow has melted and ice has retreated, leaving Akimiski Island and the Belcher Islands in the bay easier to spot. The ice has a bluish tint to it, likely because it is waterlogged and melted ice has pooled in ponds on the ice's surface. Sea ice will sometimes melt out completely in the bay during July. Interestingly, ice has moved into some areas, for instance south and west of the Belcher Islands, where it had not appeared in early April. The ice isn't spreading, it's simply moving and, broken into small pieces, it can drift easily. Unlike two months earlier, areas of open water are the result of ice melt. 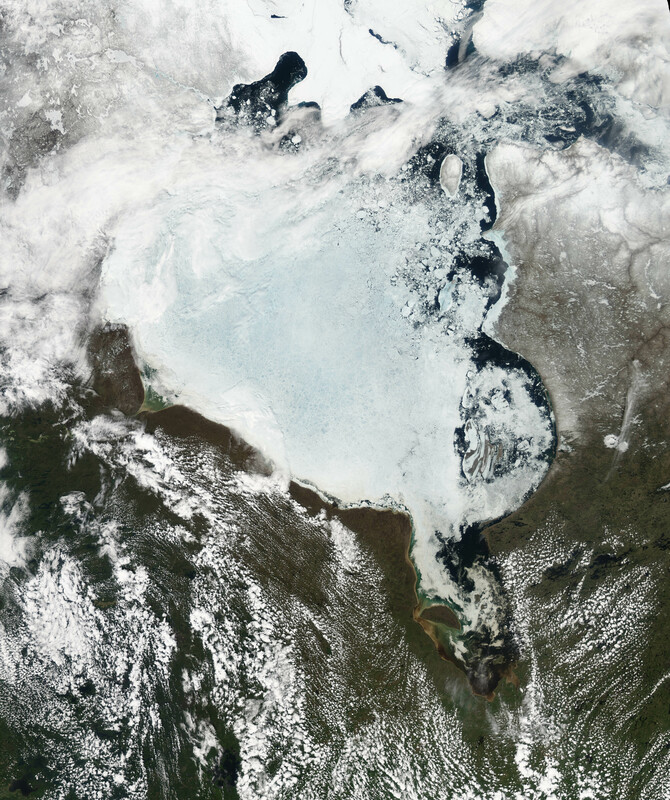 The ice in Hudson Bay has been melting earlier each spring since the 1970s. The trend has been strongest in the western portions of the bay. A 2011 modeling study published in the journal Climate Dynamics suggested that in the future, the duration of ice-covered conditions could be reduced by seven to nine weeks per year. The changes were likely to be the most pronounced in southeastern Hudson Bay and James Bay, according to the model projections. When did everything become Plastic? When I was a kid, we collected shells on the beach, not plastic trash. There wasn't enough disposable plastic in those days for plastics to collect on the beaches. Plastic bags came into heavy use in American grocery stores when I was in high school in the late '70s, early '80s. By 2010, the Guinness Book of World Records named the plastic bag the decade's single most ubiquitous consumer item on the planet. Slowly, over time, plastic packaging replaced cardboard, glass or metal to contain almost every item in the market. The petrochemical packaging was lightweight and inexpensive. It was cheaper to bottle soft drinks in plastic instead of glass. Soon drink companies realized they could sell even plain tap water as a new alternative to soft drinks, conveniently packaged in plastic, for drinking on the go. Since plastic was cheap, why not make disposable items out of it for big profits and market them as convenience items for busy people? Why wash dishes, cups and tableware you could simply throw away? Why buy a shaving device and replace the blade when you could buy one unit of plastic and metal and just throw the whole thing away when the blade gets dull? The developed countries all joined the disposable plastic craze and soon the developing countries were importing and manufacturing the stuff too. All this single use plastic packaging has led to a serious build up of plastic waste all around the globe. Since plastic doesn't biodegrade, every bit of plastic ever made still exists either in a dump, as fill or fluff in another product, or in the environment. Much of the plastic is of a type not designed to be recyclable. Like bottle caps, this plastic is designed for immediate disposal -- feminine hygiene products, diapers, or fast food containers -- or is a hybrid product that can't be recycled for this reason (like the disposable razor or the Tetra Pack paper/plastic hybrid containers for liquids); or is not cost-effective to recycle like thin plastic bags or polystyrene. Many communities in developed countries and most developing nations have no plastic recycling facilities at all. It's pretty clear that this is not a sustainable model. This is easily confirmed by a visit to a garbage dump or a beach where there is no taxpayer-supported cleanup on a regular basis. If we continue on the path of nonstop production of everlasting plastic waste, will we be buried in the stuff someday! For a glimpse of this future see Alan Weisman's The World Without Us chapter on plastics: Polymers are Forever. Beach Clean-ups organized by schools, local governments and NGOs are becoming a regular part of childhood for kids who live in coastal communities. In the week preceding the UN designated World Oceans Day, more than 8000 California school children took part in beach cleanups to rid the sand of trash and then formed giant aerial images on five California beaches, each incorporating the text "Defend our Seas." The largest of these images was a fierce shark with a spear and shield that was imagined by 11-year-old Breann Mancilla and reproduced on the sand with the help of more than 5,000 children. The children's messages in the sand are shining a light on the huge quantities of plastic waste that are filling the oceans of the world. Watch a video of Kids Ocean Day on Dockweiler Beach with aerial footage from a helicopter that is being shared with world leaders at the Rio Earth Summit this week. The Great Pacific Garbage Patch formed gradually as a result of marine pollution gathered by oceanic currents. The patch extends over an indeterminate area, with estimates ranging very widely. It is very harmful for the wildlife cause some of these long-lasting plastics end up in the stomachs of marine birds and animals. With plastic waste overwhelming our disposal systems and ecosystems, environmentalists at the Rio Earth Summit are making the case for going back to the old ways of reusable goods and biodegradable packaging. Natural Resources Defense Council and Plastic Pollution Coalition are presenting a commitment agreement for governments, businesses and NGOs to solve the plastic pollution crisis at the point of manufacture. 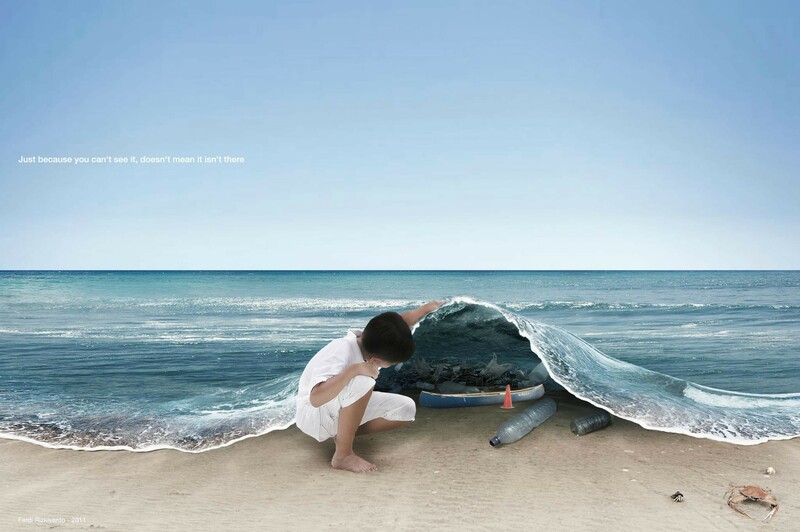 The Global Call to Stop Plastic Pollution can be viewed at www.stopplasticpollution.org. Some of the plastic pollution focused events at the Rio Earth Summit are the following: Health Impacts of Plastics on Mothers and Children and Plasticity Forum. 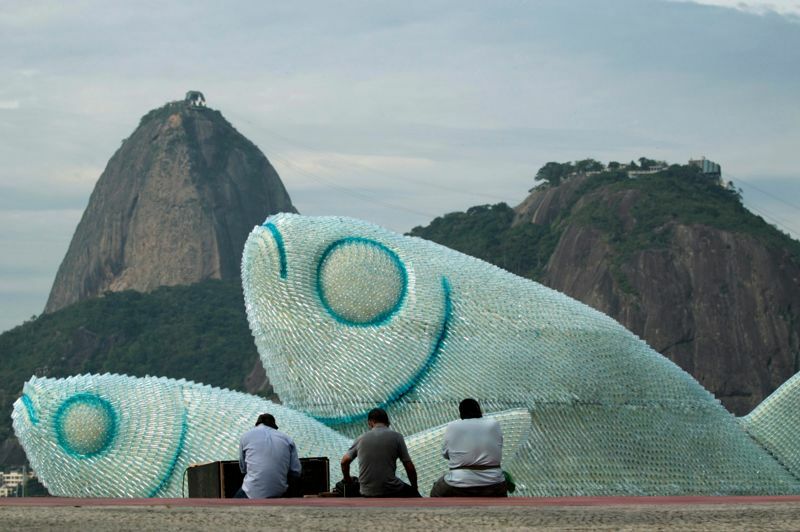 The theme of The Rio Earth Summit is "The Future We Want." Here's to a future with clean beaches and oceans where children will once again be awed by shells and sea creatures, not the remnants of careless consumption. The left side shows the depth of the saturation horizon with regard to the CaCO3 mineral aragonite, and the right side shows the surface ocean pH. Humanity's use of fossil fuels sends 35 billion metric tons of carbon dioxide into the atmosphere every year. That has already begun to change the fundamental chemistry of the world's oceans, steadily making them more acidic. Now, a new high resolution computer model reveals that over the next 4 decades, rising ocean acidity will likely have profound impacts on waters off the West Coast of the United States, home to one of the world's most diverse marine ecosystems and most important commercial fisheries. These impacts have the potential to upend the entire marine ecosystem and affect millions of people dependent upon it for food and jobs. About one-third of the carbon dioxide (CO2) humans pump into the atmosphere eventually diffuses into the surface layer of the ocean. There, it reacts with water to create carbonic acid and release positively charged hydrogen ions that increase the acidity of the ocean. Since preindustrial times, ocean acidity has increased by 30%. By 2100, ocean acidity is expected to rise by as much as another 150%. Declining pH of seawater reduces the amount of carbonate ions in the water, which many shell-building organisms combine with calcium to create the calcium carbonate that they use to build their shells and skeletons. The lower carbonate availability, in turn, decreases a measure known as the saturation state of aragonite, an easily dissolvable mineral form of calcium carbonate that organisms such as oyster larvae rely on to build their shells. If the aragonite saturation state falls below a value of 1, a condition known as undersaturation, all calcium carbonate shells will dissolve. But trouble starts well before that. If the aragonite saturation state falls below 1.5, some organisms such as oyster larvae are unable to harvest enough aragonite to build shells during the first days of their lives, and they typically succumb quickly. These changes are particularly worrisome for global ocean regions known as eastern boundary upwelling zones. In these regions, such as those along much of the West Coast of the United States, winds push surface water away from the shore, causing water from the deep ocean to well up. This water typically already has naturally high levels of dissolved CO2, produced by microbes that eat decaying algae and other organic matter and then respire CO2. Along the central Oregon coast, for example, when summer winds blow surface ocean waters offshore, a measure of the amount of CO2 in the water known a partial pressure rises from a few hundred to over 2000, causing ocean acidity to spike. But oceanographers still didn't have a good handle on how rising atmospheric CO2 levels would interact with CO2 rich waters that upwell naturally. So for their current study, researchers led by Nicolas Gruber, an ocean biogeochemist at the Swiss Federal Institute of Technology in Zurich, decided to look closely at what's likely to happen in an upwelling region known as the California Current System off the West Coast of the United States. They constructed a regional ocean model that ties together what's going on in the atmosphere and the ocean. Because this model focused on the California Current System, Gruber and colleagues were able to give it a resolution 400 times that of conventional global ocean models. In their model, the Swiss team considered different scenarios of CO2 emissions over the next 4 decades and linked these to CO2 produced in the ocean due to respiration. The buildup of atmospheric CO2 will rapidly increase the amount of undersaturated waters in the upper 60 meters of ocean, where most organisms live, the team reports online today in Science. Prior to industrialization, undersaturation conditions essentially did not exist at this top layer in the ocean. Today, Gruber says, undersaturation conditions exist approximately 2% to 4% of the time. But by 2050, surface waters of the California Current System will be undersaturated for half of the year. Perhaps just as bad, however, aragonite saturation will fall below 1.5 for large chunks of each year. This could spell doom for Pacific oysters, a $110 million-per-year industry on the West Coast, as well as for other shell-building organisms that are sensitive to changes in ocean acidity, says Sue Cudd, owner of the Whiskey Creek Shellfish Hatchery on Netarts Bay in Oregon. Another species likely to face difficulty are tiny sea snails known as pteropods, which are a vital food source for young salmon. The new results are "alarming," says Richard Feely, a chemical oceanographer at the National Oceanic and Atmospheric Administration's Pacific Marine Environmental Laboratory in Seattle, Washington. "It's dramatic how fast these changes will take place." George Waldbusser, an ocean ecologist and biogeochemist at Oregon State University, Corvallis, says it's not clear precisely how rising acidity will affect different organisms. However, he adds, the changes will likely be broad-based. "It shows us that the windows of opportunity for organisms to succeed get smaller and smaller. It will probably have important effects on fisheries, food supply, and general ocean ecology." Oceans experts have teamed up with Google Earth to develop a new online tool to allow users to dive into the ocean and explore under the waves. The initiative was unveiled at the Rio+20 Earth Summit where campaigners are fighting for a new agreement to protect the environment. Australia plans to create the world’s largest network of marine reserves, encompassing a 3.1 million square kilometer patchwork of coastal waters, the government announced Thursday. The move is aimed at balancing protection for the country’s delicate reefs and marine life, which are facing growing environmental pressures, with the demands of its booming resource-driven economy. Under the plan unveiled by Tony Burke, the minister for sustainability, environment, water, population and communities, fishing and oil and gas exploration would be restricted in nearly one-third of Australia’s territorial waters, an area of 1.2 million square miles that includes the pristine Coral Sea off the country’s northeastern coast and the iconic Great Barrier Reef. The health of that World Heritage-listed site has become a major concern, as scientists have warned that climate change and population pressures pose threats to its long-term survival. “The maps I have released today are most comprehensive network of marine protected areas in the world and represent the largest addition to the conservation estate in Australia’s history,” Mr. Burke said in a statement. The number of marine reserves would rise to 60 from the current 27, which cover 800,000 square kilometers of protected waters. The proposal is expected to be approved by Parliament and take effect late this year. Mr. Burke said that the government expects to pay about 100 million Australian dollars, or $99.3 million, to the fishing industry in compensation for the new restrictions. But the plan drew mixed reviews from environmental groups, which, while broadly supportive of the overall goal of sheltering delicate marine ecosystems from exploitation, complained that it did not go far enough to safeguard areas that are rich in oil and natural gas reserves or under pressure from industrial fishing. The Australian Conservation Foundation, a leading environmental group, welcomed the protections the plan would grant to areas that it said are home to 45 of the world’s 78 whale and dolphin species, six of the seven known species of marine turtle, and 4,000 fish species. The foundation was more critical of exemptions for exploration in energy-rich areas, particularly along the coast of Western Australia. “With Australia’s magnificent natural endowment of unique marine biodiversity comes a responsibility to protect our oceans from the risks of bottom trawling and oil and gas exploration,” the foundation’s executive director, Don Henry, said in a statement. “Although the reserve network bans oil and gas exploration in the Coral Sea, the northwest region has been left vulnerable to these threats,” he said. Albany Canyons and Rowley Shoals off Western Australia and the Gulf of Carpentaria are two other areas of particular concern that are not covered under the plan, he said. Deakin University and Parks Victoria marine scientists have captured rare video of fish and other marine creatures living off the coast of Western Victoria, 100 metres below the ocean surface. This project is essentially a census of the fish population and will tell us about what fish live where, how many of them there are, what their habitat looks like and how they interact with other species and across habitats. The results of the research will help inform management of marine parks. Last month, Martin Ferguson, the minister for resources and energy, opened up 27 new areas for oil and gas exploration, even though these had been under consideration for marine protection, raising concerns among environmental groups and advocates for the fishing industry about concessions made to the mining sector in mapping out the reserves. Among the areas excluded from the plan are resource-rich swaths off the west coast and in the Great Australian Bight — a massive open bay off the central and western portions of the country’s southern coastline. “I am disappointed that, despite the significant scientific evidence demonstrating the conservation values of these areas, the short-term gains of the resources boom have won out over long-term planning,” she said on her Web site. The planned expansion of the reserves continues the bipartisan work of successive administrations, beginning in 1998 with the oceans policy of the Liberal prime minister, John Howard. TheGuardian : Does Australia's marine reserve plan justify the grand rhetoric? This is what love surfing is about.